Incorporated Name: Plan Ahead Events, Inc.
Plan Ahead Events was founded by Ray Titus, CEO of United Franchise Group; a family of five franchise brands, which are all rated #1in the world in their industry. . When the challenges of running their large corporate events got to be too much for his employees, Ray decided to seek out the professionals and contracted with an outside company to run their largest international convention. The two women of this company, who had left their corporate jobs and started their business from home, had seen over 15 years of success. Ray and United Franchise Group were so impressed with the benefits of using their services that in 2008 they became the first Plan Ahead Events office and part of the United Franchise Group family of brands. Since that time, over 100 Plan Ahead Events franchises have sold worldwide in over ten different countries. 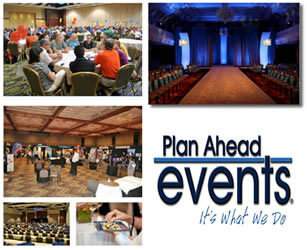 Plan Ahead Events is now the world’s largest event management company and is still the only full-service meeting and event franchise that exists. Full training and support. No experience necessary!! Though this type of experience isn’t necessary, existing franchisees have often come from sales, marketing, project management or ex-corporate backgrounds. Plan Ahead Events is currently accepting inquiries from the following states: Wyoming, West Virginia, Wisconsin, Washington, Vermont, Virginia, Utah, Texas, Tennessee, South Dakota, South Carolina, Rhode Island, Pennsylvania, Oregon, Oklahoma, Ohio, New York, Nevada, New Mexico, New Jersey, New Hampshire, Nebraska, North Dakota, North Carolina, Montana, Mississippi, Missouri, Minnesota, Michigan, Maine, Maryland, Massachusetts, Louisiana, Kentucky, Kansas, Indiana, Illinois, Idaho, Iowa, Hawaii, Georgia, Florida, Delaware, Washington, D.C., Connecticut, Colorado, California, Arizona, Arkansas, Alabama, Alaska.